Sarah took the day off from work today so we could finally get to the Frida & Diego: Passion, Politics and Painting exhibition at the Art Gallery of Ontario (it closes on Sunday). 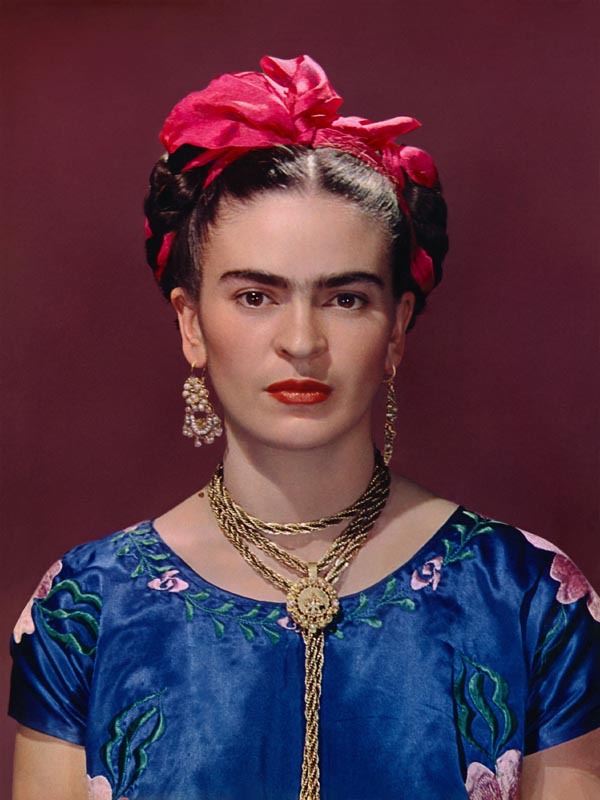 Sarah is a huge fan of Kahlo's creative and life accomplishments and had already attended a talk by Hayden Herrera back in early December but had not yet walked the show itself. We were trying to time it—as we did with the Picasso exhibition—to minimize the crowds around us; for the most part, we accomplished this except for two large school groups that came in just after us and which we managed to avoid (more or less) by hanging back a bit in the first two rooms. There was a third tour, however, that we managed to keep in our sights for most of our time there: an AGO staffer had about six young schoolkids in her charge and was taking them from room to room, sitting them down and giving activity-based talks to them which were absolutely captivating. Even though Frida Kahlo was the main draw of the show—a fact that was reinforced by virtually all of the AGO's advertising—more than half of the works on display were by Diego Rivera. This would make sense from the aspect of the size of their individual bodies of work (Rivera's number of "creative years" was roughly double that of Kahlo), but because the exhibition was curated approximately chronologically, it did take a while before a visitor encountered any of Kahlo's art (with the exception of two portraits, one of Rivera and a self-portrait, which were displayed on the wall of the "antechamber" to the exhibition proper). This is not a criticism, though: I felt that the timeline-based experience was greatly helpful to a patron unfamiliar with the works of these two artists, such as myself. It also gave me a chance to experience Rivera's early work on its own merit; some of his cubist pieces were quite interesting to me. 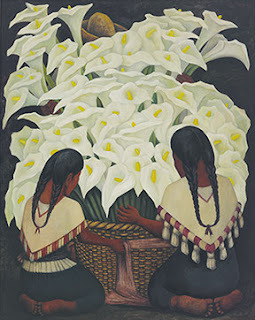 I think, though, this particular Vendedora de alcatraces from 1943 (I say "this particular" one, for Rivera did a great many similar pieces) was my favourite of his exhibited works. 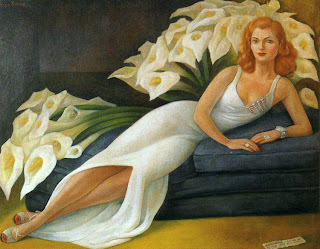 I wasn't really drawn to much of what he created, I must say; it seemed to me that when Rivera really was passionate about something he could create extremely captivating pieces but, more often than not, I felt he "left something in the tank" when he had completed much of his work. I realize that this is a pretty shallow comment to make, but it approximates how I felt while walking through the exhibition; admittedly, much of his very best work—his murals—was not truly represented at the show for obvious reasons. There were plenty of photographs of these murals which showed the spirit of the works if not the true essence. 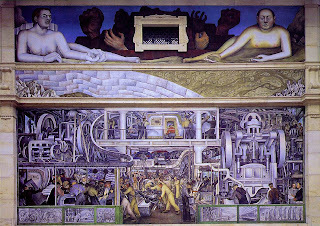 The main focus was on two pieces in particular: Detroit Industry at the Detroit Institute of Arts (partially seen here) and Man at the Crossroads, commissioned for the Rockefeller Center in New York, begun in 1933 but never completed and later destroyed when Nelson Rockefeller objected to the depiction of Lenin in the work and Rivera refused to remove it. 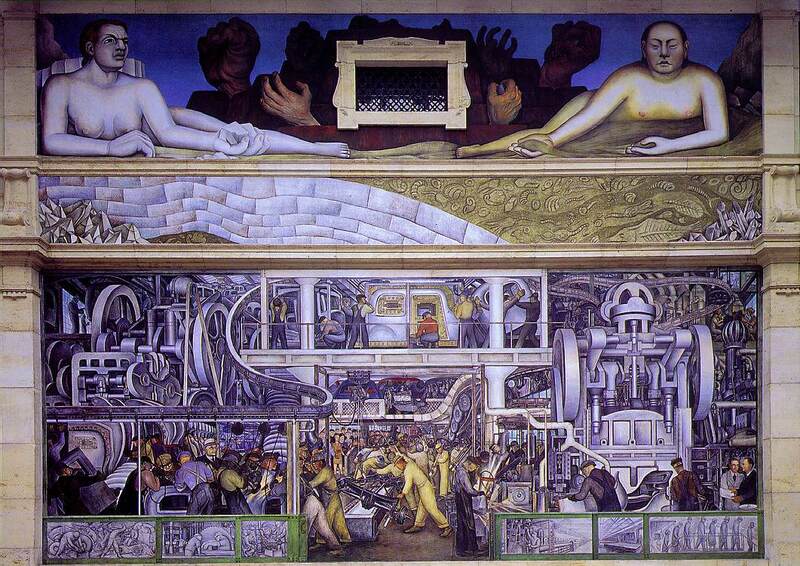 There wasn't much in the way of physical evidence from the Rockefeller mural; however, there was an entire room devoted to the Detroit piece, including what may have been my favourite display of the entire show: a photo taken of the mural being created while Rivera and Kahlo, slightly out of focus and not in the centre of the photo, share an intimate moment that looks for all the world like a secret, stolen kiss. It's really quite lovely and the gallery presented it blown up to such a degree that it seemed nearly life-sized. The story of their passions—for each other, for their causes, for Mexico itself—infused this show to such an extent that I could never do it justice in this short(ish) blog piece. I urge you to check out the AGO website's exhibition listing for more complete information. Or, for the best experience you could possibly have, attend a showing of Frida Kahlo's work anywhere in the world with the amazing Sarah Gledhill. I would not have gleaned 10% of the information I came home with—even as well-curated as this show was—had I not had her as my own private tour guide. I think the best comparison I can make is this: the show, as presented, was two-dimensional; Sarah made it 3D. She is such a font of information about Kahlo (and Rivera, tangentially) that everything I saw and read leaped off the wall at me. I was fascinated by much of Kahlo's work (and would love to have seen more) but I think it was the photos of her taken by brilliant camera-based artists such as Nickolas Muray (as in the photo here) and Lola Álvarez Bravo, among others, that really stand out in my mind after leaving the AGO. 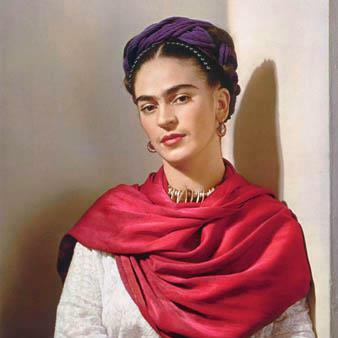 Frida Kahlo was a strikingly beautiful woman, which is something I knew before the show but never really understood for myself until I had a chance to see these pictures. There were many photos of her surrounded by her work, including some where the piece she was creating was only in its early stages; these always fascinate me immensely. There was an entire shrine-like corner of the penultimate room which was dedicated to La Casa Azul, Frida's family home in Coyoacán which later belonged to her and Diego and is now the location of the Frida Kahlo Museum. But beyond all of the photos showing us how she looked and worked and lived, there were Kahlo's own creations which told the story of what was going on inside through all of the tribulations of her too-short life. These were riveting to the point of being almost painful through much of her body of work. 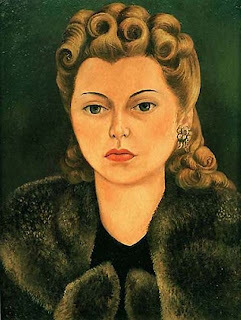 Her portraits, though, of friends and other acquaintances were brilliant and captured (I feel) the character of her subject matter as much as they did the outward appearance. From the colour of her hair to the expression on her face to the detail of the stole around her neck, this latter portrait is far more interesting to me than the former. I believe, also, that it's likely far more accurate in its portrayal of the subject at hand. And then it was over. There were photos of Kahlo's deathbed and funeral, a handful of Rivera works from after her death and then photos of his own deathbed and funeral, for he only outlived her by three years by the calendar, but half a lifetime in real time. After we left this exhibition we passed through a room with an ofrenda (essentially an altar or shrine) to Frida and Diego. There were also enormous Judas figures and catrinas in this room and I'll devote part of a coming blog post to them. After that, we viewed two more interesting exhibits; similarly, I'll get to them in the next couple of days. I'll leave you here with four photos of the banners that hung in the entrance to the Frida & Diego show, as the messages here encapsulate the two artists rather well, I feel. Nice review of the show. I would have loved to have seen it with you guys. Zoo Tour with the "Plant Guy"
"Truther": Just Another Made-Up Word for "Crazy"
Our First Walk of the "Spring"!